Victoria’s snow season is upon us, and with some of the best snowfall in years, there has never been a better time to explore the state’s bewitching Alpine region. Just three hours away from Melbourne lies Mt Buller, a classic ski village where you can try your hand at almost every kind of winter sport, and the perfect location for wintry daytrip. Packing for a daytrip to the snow requires careful consideration, as the extreme weather can turn an adventure into a disaster if you’re not properly prepared. This week, we run through the essential (and a few novel) things you should pack for a trip to the snow. 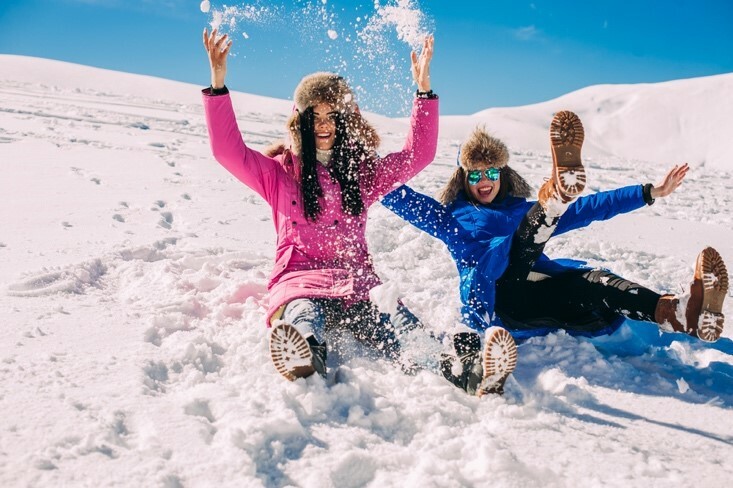 If you’ve never been to the snow before, packing sun protection might seem a bit counterintuitive but the UV rays on a snowy mountain are just as powerful as they are on a tropical island. The sun reflecting off the snow is powerfully bright and can give you some serious sunburn if you’re not careful. The icy wind in alpine regions can be quite harsh, so it pays to have some heavy duty SPF lip balm at hand to keep chapping at bay. Scroggin is the traditional snack of the outdoorsman, and is designed to give you a boost of energy, without weighing you down. Even if you’re not a fan of nuts and seeds, it’s a good idea to bring some kind of small, high energy snack like a muesli bar or lollies along with you if you plan to try your hand at some winter sports, as the cold weather combined with vigorous exercise means you’ll burn calories at a much higher rate than usual. Victoria’s snow season is short but beautiful, and we guarantee you’ll want to capture the ephemeral charm of this winter wonderland once you arrive, so a camera is an absolute must. If iPhones and Androids are your usual photographic equipment of choice, it still pays to bring a digital camera with you, as buttons are much easier than touchscreens to manage when you’re wearing thick winter gloves. The winding road up the mountain is all the more majestic if you have an epic winter soundtrack to match it. Snow is wet and damp socks can put a major downer on your trip if you have to sit with cold feet for the three hours back to Melbourne. Packing a spare pair of thick socks (maybe even Ugg boots) to put on when you get back on the bus means you can enjoy a warm and comfortable trip back. You can even take the cosy levels up a notch by bringing a hot water bottle and asking one of the cafes to fill it up before it’s time to leave. Melbourne on the Move runs day trips to Mount Buller between June and September. To book your place on one of our bus tours departing from Melbourne, please don’t hesitate to get in touch by calling 1300 55 86 86.